I currently have an insanely complicated home theater setup that takes up half my closet, connected by a rat’s nest of cables that I dare not touch lest I inexplicably lose the left audio channel on my Blu-ray player. It’s ridiculous, it’s completely overkill for my needs, and did I mention it takes up half my closet? My tiny, Manhattan-sized closet? My home theater receiver is huge. Massive. It’s 10” tall, 20” deep, weighs 800 lbs, and probably draws more power than our air conditioner. Despite its long list of capabilities, it has but two jobs that are of any use to me: 1) switch between my various components, and 2) make things loud. As I rather enjoy home theater stuff, I thought I’d try to come up with a few options for him. Nonetheless, I did find a handful of options that I thought might work for Dan. I didn’t come across a single perfect product—for instance, some were small, but had a lot of buttons, while others were relatively larger but had few buttons— but I think there’re some promising options here. This is a pretty darn small receiver. It’s the narrowest (width) and lightest (weight) of the bunch, and even though the Sherwood beats it on height and depth, the Yamaha is only 3/4" taller and 3/8" deeper. This receiver also has the fewest front-panel buttons: 2 (volume knob & power button). Oddly enough, I had some trouble confirming this receiver’s power output; the specifications I was able to find weren’t all that explicit in this regard, but the unit appears to either have 35 or 50 Wpc as best as I can figure. The Marantz may be the most traditional of the receivers here. While its dimensions might not be as low as the other receivers here, its height is only 9/16" taller than the next-shorest model (the Yamaha) and 1 5/6" taller than the shortest (the Sherwood). Even then, it’s still about 1/3 shorter than a standard receiver and about half the weight. Even if the Marantz might not seem as impressive as the others when it comes to size, it does have a few things going for it. For one thing, its back panel includes 2 optical inputs (and 2 coax digital inputs). Granted, Dan mentioned only needing a single optical input (which the Sherwood and Yamaha have), although I can’t help but wonder if that second input might potentially come in handy if Dan were to ever get another device such as an X-Box or a TiVo. Another potential advantage of the Marantz is its pedigree. Marantz is owned by D&M Holdings, a company that also owns Denon, McIntosh, and a few other brands. I’m not saying that Yamaha is a slouch—although I have my suspicions about Sherwood—but Marantz is a brand that’s known for its attention to detail and build quality. I would expect any of their equipment to last for many years. There may not be a clear winner here, but there may be a receiver that’s best for you depending on the features that you value most. I would only consider the Sherwood if sheer size is your utmost concern. It’s not the lightest of the bunch, but it’s definitely the shortest. On the other hand, I’m a bit skeeved out by its build quality—if they’re already screwed up the blue LEDs across the front, how much else might be sub-par? For most people, I think it comes down to the Yamaha and the Marantz. On one hand, the Yamaha is the cheaper of the two ($180 vs. $400), but on the other hand, the YMC-700 (which goes for $500) seems like a justifiable step-up considering that model’s WiFi streaming (née Ethernet) and iPhone app support. So, depending on which Yamaha model you’d be putting up against the Marantz, it could be a toss-up between those two brands on price. If I were in Dan’s shoes, I might lean toward the Marantz. All the same, the Yamaha would not be a bad choice either. I first upgraded my car audio in 2002, primarily to get Sirius satellite radio, but also as a step up from the factory audio system. The system worked very nicely until about a fortnight ago when one of the channels in my amp died. And, since it had been about five years since I had bought it, the amp was well out of warranty. Since I had to buy a new amp anyway, I told myself that I may as well upgrade my subwoofers as well (hey, why not?). Though my previous subwoofers, a pair of 10" MB Quart subs, had served me well, I had always hoped for a little more bass extension. So, after doing a bit of research, I picked up a pair of 12" JL Audio 12W3v3 subs. In my old configuration, I was running my MB Quart subs off a multichannel amp — not to worry, it was a 5-channel amp — but I figured that I'd go for a separate amp for the subwoofer this time. So, I picked up JL Audio’s 500/1 monoblock amp for that. I just had the new gear yesterday and, as a whole, I’m very pleased with it. It certainly has the bass extension that I was looking for. Depending on how you look at it, it’s almost too much of a good thing — after driving around town for a bit this afternoon, all the while listening to Sirius at normal volume levels, I noticed when I got home that my ears were ringing a little bit. Feh. My best guess is that it may not have seemed as loud as it actually was since the frequencies were so low. Either way, the last thing I want to lose it my hearing, so I’ll be adjusting that straight away. PS The lighting in the shot above may look a bit weird, but rest assured that I don't have a sodium vapor lamp in my trunk. (Those are the ugly yellow/orange lamps commonly seen around parking lots and the like.) 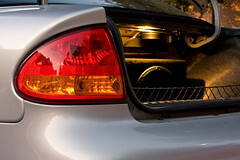 Rather, the sun had already started to set (I took that picture with a 13 second exposure around 6:30 p.m.) and, while I was able to correct the color balance for the exterior sunlight, that meant that the incandescent light within my trunk was going to look a little exaggerated. Update 2007-02-19: I took my Radio Shack sound level meter (similar to this one, but an older iteration) out to the car to look into my volume issues yesterday. That particular meter has both “Fast” and “Slow” response modes that control how fast the needle moves. The “Slow” mode is good for getting an average sound level, but I set it to “Fast” in this case so that I could get differentiate the second-by-second sound levels within songs. I turned my key to the “Accessories” mode and then chose a Sirius radio station that was playing a song that I liked. As it turned out — listening at ordinary volume levels — the normal parts of songs were around 70–72 dB. When the bass started to come in, though, I could see fraction-of-a-second spikes of up to 95 dB. Well, yikes, that would kinda explain the ringing in my ears from the other day. I soon went about reducing the subwoofer gain and ended up on what happened to be its lowest setting. From there, I took some more measurements and found that bass-heavy musical phrases were only reaching into the lower 80s (whew). I may do some more adjustments later (if only to see if I can further level the frequency response), but at least my hearing should be safe for now. So, why am I jazzed about Oggs? Well, in addition to their higher sound quality at a given bitrate, Oggs also have the advantage of being patent-free — patent-encumbered mp3s could have their license changed at any time. And, since none of my own music is digitized yet, I’m not locked into a format for music already on my hard drive. So far, the Craft 2 (as they call it) looks like a decent player. But, I’m a bit torn by its flash-based storage. Though the product isn’t widely available at online retailers yet, it is listed in iRiver’s online store and the 1 GB model has a list price of $400 (gulp). For that price I could get a 20 GB iPod! Maybe I wouldn’t mind paying such a premium for flash if there were distinct benefits over a hard drive-based player. Normally, flash-based players would be less prone to skipping (since they can’t skip) but, from what I’ve heard, hard drive-based players are rugged enough that they hardly skip in the first place. Really, it looks like battery life would be its main benefit. And I’m just not sure whether that's enough to justify its price. Or… are there any other flash benefits of which I’m not aware?